by first time mum Suzy. On receiving the Kiinde Twist Starter Kit I was first struck with the modern aesthetics of the bottle. It is very unique and is sure to get a positive comment when out in public. The best part about the bottle is the interchangeable bags. They fit easily and snugly into the shell of the bottle. Easy! No mess, no fuss! And no constant scrubbing or sterilising of the bottle which saves you a lot of time (not to mention the fingernails)! 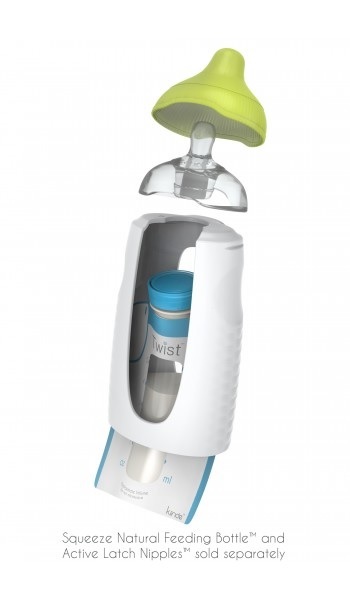 The bottle itself is very well manufactured and although I have only used it for a short period of time, it appears to be durable and the flat base means it does not tip easily. 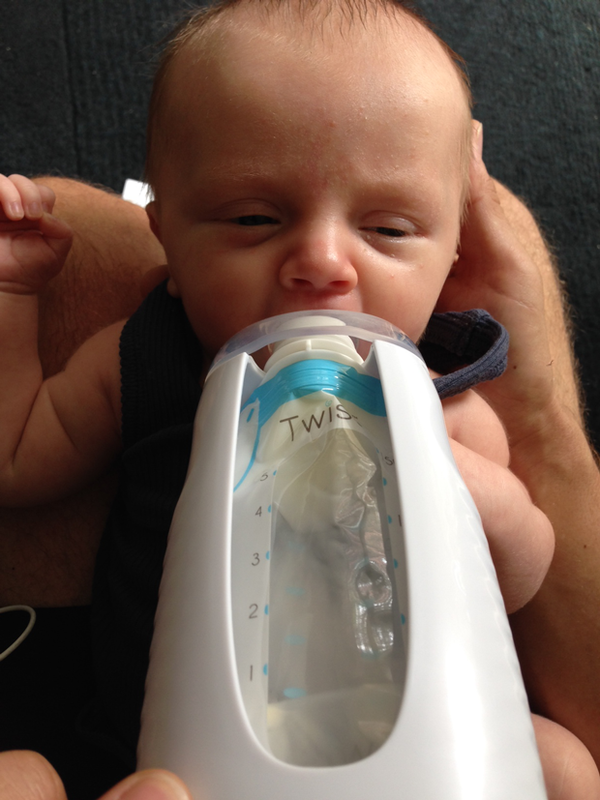 The slow flow teat was excellent for our NB. Our baby latched onto it well and it was a slower flow than most that I have tried which meant that he had less wind and was not sick at each feed. After trying the product there were a few things that I would mention to people interested in purchasing. As a mum who is mostly expressing so that I can keep a track of the amount I am feeding, it is imperative that I have an accurate measure of milk. As the interchangeable bags are plastic and inflate as they fill, it is impossible to know exactly how much milk has been expressed. The bag fills out as you express into it so the fuller the bag, the more accurate the measurement. It is also very difficult to see how much of the bottle bub has actually drunk. If this is not important to mums, then this product would be suitable. 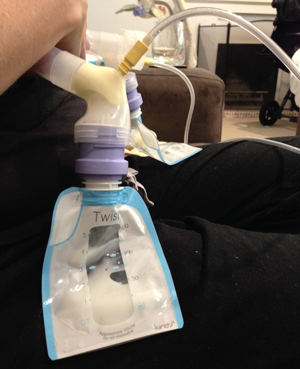 The adapters provided which fit onto the rim of each bag and attach to your pump are also a great benefit. It meant that the bag fitted easily to the brand of pump that I was using. The downside is that if you are expressing from both breasts, you need to keep a firm grip as the adapter fell of one of mine and it was a little messy… however this may have been a user issue! The bags also allow you to store the expressed milk for later and the kit comes with a storage shelf. 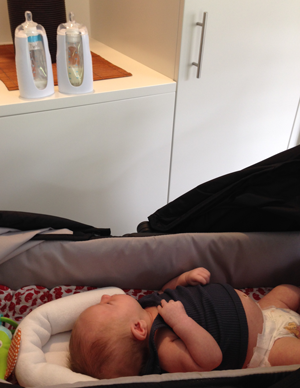 The shelf is fairly compact allowing storage of up to 12 bags however, as a mum who’s baby is a super eater, I would not have use for a unit with so many compartments. I am lucky to be able to store one or two spare bags for a rainy day so again this would be of no use for someone like me and would take up too much bench/fridge space. Overall, the Kiinde Starter Kit is a very convenient and well designed product with lots of benefits for a mum on the go. If you are not too fussed about the exact quantity of milk you are expressing used for the bag insert, then this may be the product for you. Recycle after use – no dirty dishes! 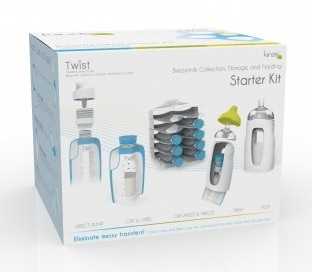 I have one Kiinde Twist Starter Kit to giveaway. – leave a comment below answering this question: What particular feature of the Kiinde Twist do you think would make your life easier? Competition ends 18 April 2014 and full terms and conditions can be found here. Oh My! I cannot even begin to tell you which part of this system would be fantastic for us! My 15 month old is showing no signs of weaning however I am showing signs of wanting to get out more! This would be so suited to our current situation! I think it’s a truly great product!